It’s unboxing time! 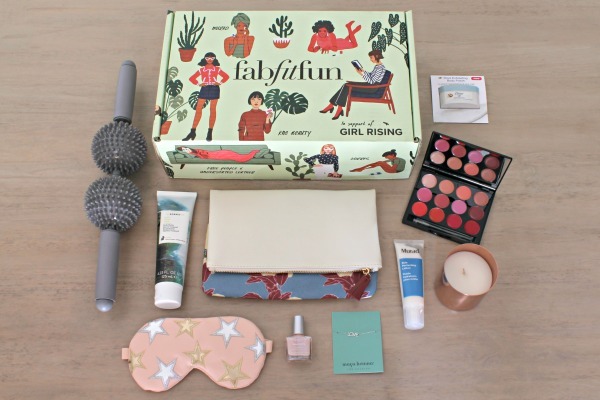 The Spring 2018 box is my 4th box from FabFitFun and the last from my year-long subscription. I still really love getting these every season, so I’ll probably sign up for another year when summer rolls around. Today I’m going to show you all of this season’s items. As I mentioned above, I signed up for a full year, so I’m considered a select member. That just means that I’m able to choose between colors/styles for a few of the items. The rest of the items are a surprise (although I’m terrible with surprises, so I always look for spoilers ahead of time). I love being able to pick my colors, but it’s fun to have a few surprises too. This box didn’t seem to have a big ticket item like some of the previous boxes, but I think this reversible clutch from Rachel Pally ($60 value) was supposed to be the hot item. This was one of the select choices, so I was able to pick from 3 different colors/patterns. I picked the Bloom print, but there was also an orange floral option or aqua “paradise” print option. It’s cute and well-made, but I don’t see myself using it very much. 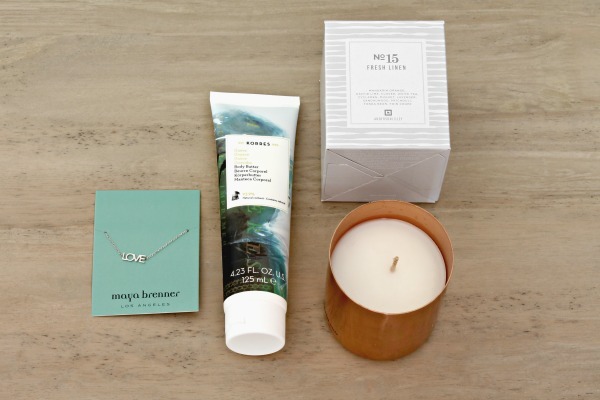 My other select choices were this Maya Brenner Designs “Love” bracelet ($65 value), KORRES Guava Body Butter ($24 value), and Anderson Lilley copper candle ($45 value). For the bracelet, select members were able to pick between the bracelet (available in 2 colors) or a pair of Ettika Day Dreamer Tassel Earrings (also available in 2 colors). The earrings were cute, but I have really sensitive ears so I probably wouldn’t have been able to wear them. The bracelet ended up being a great pick! It’s so cute and fits perfectly! We were also able to pick between the body butter or KNC Beauty Lip Masks. I came SO close to ordering the lip mask because they’re something I’d NEVER buy for myself and that’s kind of the whole point of this box. But then I read a couple mediocre reviews about them in the forums and switched to the body butter. So far I really like the body butter. The scent is light and slightly fruity. The Anderson Lilley candle was available in 3 different scents and I picked Fresh Linen. The other choices were Manhattan Beach or Super Bloom. I was a little nervous about the scent, but the candle smells amazing. It’s exactly that fresh scent that you would imagine linen to be. These next two items came in different colors, but they weren’t part of the selection process, so they were a surprise for everyone. 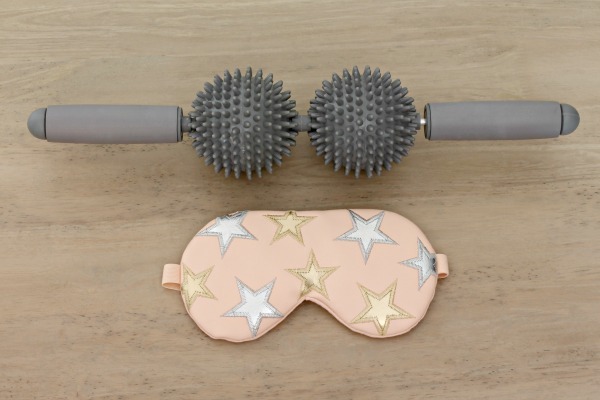 I love that this vegan leather Free People x Understated Leather Starry Eye Mask ($40 value) includes a cooling insert. It fits my face perfectly and really helped soothe a headache I had the other night. The Physique 57 Massage Roller ($20 value) was available in multiple colors, but I ended up with a gray one. At first I wasn’t excited about this product because we already have a couple massage rollers that we don’t really use, but this one feels so good. The spiky balls almost feel like they are scratching your back and it feels amazing. I tried it on the dogs and Abby is obsessed…it’s seriously so cute. Ringo liked it too, but Jelly was too scared of it to enjoy it. And finally, these last few items were sent to everyone. First the Dermelect Cosmeceuticals Makeover Concealing Ridge Filler ($18 value). I normally don’t like anything on my finger nails and pick off any polish, but I love this so far. It makes my nails shiny and a little shimmery, but it’s not thick like nail polish, so I’m not as tempted to pick at it. The next item is the Murad Skin Perfecting Lotion ($40 value). I've been using it for the past few nights and I like it so far. My skin looks clear, but doesn't feel dry. And lastly, the ISH Lip Statement Palette ($42 value). I don’t wear a lot of lip color, but it’ll be fun to play around with different colors. We also received a sample of Dove Exfoliating Body Polish. It was a sponsored item, so it’s not included in the value of the box. So that’s everything that was included in the Spring 2018 box. Overall I really liked this box, but I still think the Winter 2017 box is my favorite. Like I’ve said before, I wouldn’t have picked out any of these products on my own, but that’s the point of the box for me. My favorite items are the candle, sleep mask, and nail product. My box included $354 worth of products for only $45! I don’t think a lot of these items are actually worth the full price, but they are all definitely worth more than $45. 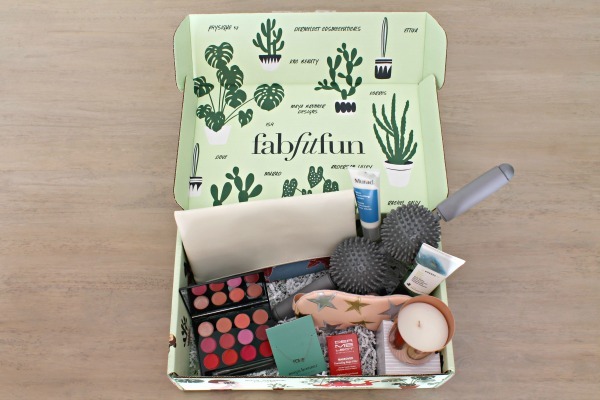 If you want to try FabFitFun, you can use this link and coupon code WELCOME10 to save $10 off your first box. If you don’t want to commit to a full year, you can sign up with that link for just one box, get everything for $40, and then cancel. Do you subscribe to any subscription boxes? I’m still thinking about signing up for CauseBox. I don’t want to spend the extra money, but the boxes look so good. I’ll probably wait until all of the spoilers are out and decide then. Love this! 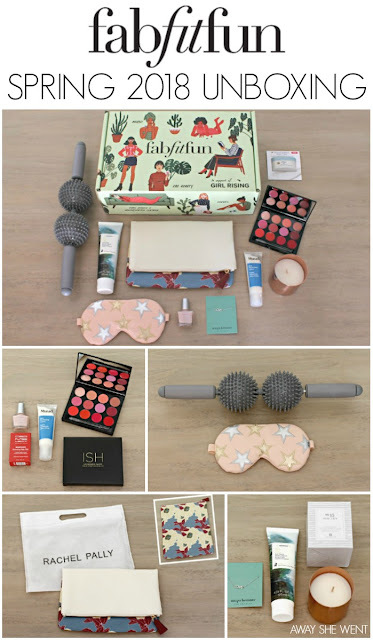 I've been wanting to try Fabfitfun and your post totally convinced me! You should! It's such a fun treat every quarter! I love that bracelet! What a fun box! When I first saw the picture online it was hard to tell the scale and I wasn't so sure about it, but I love it in person! It's so dainty and is the perfect size for my small wrist! Such cute items in there! Love the stars on that mask! The mask is so cute and so comfortable! I love this! That box looks amazing. I have always wanted to try Fab Fit Fun! Yes! It would be an amazing gift too! Awee this box looks amazing! It was too expensive to get to Canada but I miss it so much! From what I've read in the forums isn't not as good of a deal if you live in Canada and you don't usually get the sponsored items. Such a bummer! Score! You got some good stuff. I've been on the fence about trying FabFitFun but after reading this I think I'm going to give it a go. Thanks! Do it! It's such a fun surprise every quarter!